There is an undeniable giddy joy in watching this film. A film that has no real sense of story, no attachment to the real world. It exists only so much as it exists. This is a film where a woman can be in a coma for four years, wake up and escape the hospital, and somehow is able to buy plane tickets, clothes, and a motorcycle. In the real world how would she come upon the money to do all this? It's easy to do in this world, though; she needs all those clothes and that motorcycle becuase that's what would be the coolest for her to have for that particular moment in the movie. Like all reviewers before me have said, this movie is not about what happens, but HOW it happens. It is 100% style. Actually, I should say that it's 100% styles, because it incorporates almost every style of asian action flick within itself. And this is only the first half of the film. I loved watching this film. At almost every turn, in every frame there is somethign to delight in and point to and go "wow!" or "look at that!" 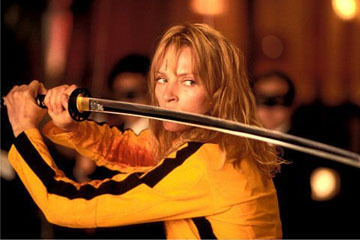 Much like Pirates of the Caribbean or Full Throttle, Kill Bill is just chock full of irrational exuberance. But unlike those films, Kill Bill isn't burdened by a story, so it is able to move from exuberance to exuberance without having to take time out to try to put together a rational narrative. As is usual for QT, he doesn't even present this film in chronological order, but rather puts the acts together in the order that makes them the most fun to watch. Kill Bill feels almost completely uncensored. Much like the recent Robert Rodriguez films (the man to whom QT gives special thanks in the credits here), it seems as though QT just thought, "what would be completely kickass to happen next" and then has it happen. As such every moment fills you with the joy of knowing that you're watching people do what they love doing more than anything else in the world.